I’ve been doing some genealogical research lately, mostly on Ancestry.com. 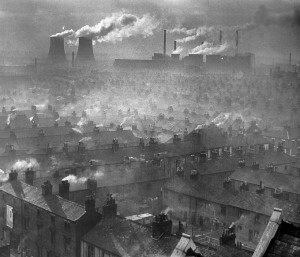 This is Leicester, an old city in the East Midlands of England, and this image represents local conditions at some point during the Industrial Revolution though I don’t know the year. Great Grandfather Charles Laws was born there in 1870. Great Great Grandfather James Laws (b.1846, but elsewhere) was a hatter, haberdasher, tailor, or outfitter, depending on which source you read. This won’t do in the sense that there is a heavily dense population living right next to the working station or the fact that they are basically living in smog? Either way, glad someone realized that it needed some planning evaluation. Yes. 🙂 Much of what became organized planning was a reaction to the conditions present during the Industrial Revolution. Not unlike what’s happening in China now, massive industrialization lead to great numbers of people moving to cities. This meant that in a few decades, you had conditions that became pretty close to untenable, though obviously many did. From the bits I’ve put together, my ancestors had decamped for Kent in the south by the next UK census, though I don’t know if conditions were any better there.